The Brazilian appeared 32 times during Atletico’s title-winning season last year and made 127 appearances for the club in total. 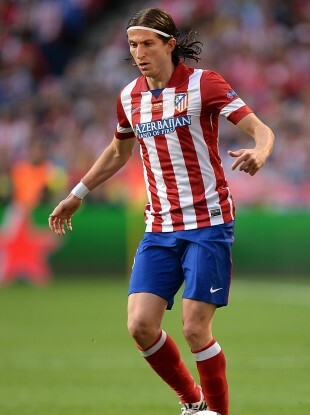 Filipe Luis pictured playing for Atletico Madrid. CHELSEA HAVE REACHED a deal to sign Filipe Luis from Atletico Madrid subject to the defender agreeing personal terms with the Premier League club. Luis impressed as Atletico won the Spanish title and reached the Champions League final last season and the Brazilian left-back is likely to fill the void left by Ashley Cole’s move to Roma. The 28-year-old is poised to become Chelsea’s second signing from Atletico in the last 24 hours after Spain striker Diego Costa completed his move to Stamford Bridge on Tuesday. Luis is reported to have cost £20 million ($34 million) after Chelsea agreed to pay the buy-out clause in his contract. A statement on Atletico’s website added: “Atletico Madrid and Chelsea have reached an agreement to transfer the rights of Filipe Luis, pending a medical with the English club. Blues boss Jose Mourinho got a close look at Luis when Atletico knocked Chelsea out of the Champions League semi-finals last season. His dynamic displays convinced Mourinho he was the ideal candidate to solve the left-back dilemma which has troubled him since Cole fell out of favour last season. With Mourinho believing Cole was no longer playing well enough to start on a regular basis, he was forced to use Cesar Azpilicueta, a right-back by trade, out of position at left-back. But with Chelsea finishing last season without a trophy, Mourinho is determined to avoid a repeat of that make-shift situation and he moved quickly to tie up a deal for the Brazilian. Luis joined Atletico from Deportiva La Coruna in 2010 and has made 98 appearances in all competitions for the Madrid side, winning the Europa League in 2012 and the Copa del Rey in 2013 before last season’s title triumph. He has four Brazil caps and was placed on Luiz Felipe Scolari’s standby list for the 2014 World Cup. Email “Chelsea agree reported €25 million deal to sign Atletico's Luis”. Feedback on “Chelsea agree reported €25 million deal to sign Atletico's Luis”.